Anna Fredriksson is a fashion illustrator that was chosen by H&M for an Art by collaboration. 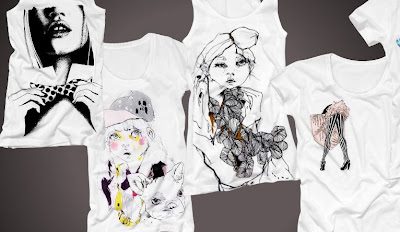 Which means she did some amazing drawings printed on Divided t-shirts and tanks available on H&M this spring/summer. Along her, another artists were chosen: Lina Boden did some sketch/computer art drawings, while Jo Ratcliffe was inspired by celebrities, Kate Moss and Lindsay Lohan being the recognisable faces on the tshirts. My favorites are the cutie dolls Anna Fredrkisson did, they some how remind me of my "Sailor Moon" period back when i was a teenager, especially the bunny ears girl. The characters are cute, in a cool kind of way, and i find my self totally in the sketch printed t-shirts area those days. Ever tried to wash a piece of art?